Customer service for most governments today continues to be more about lip service and symbolism, than real service. All too often, what passes for customer service are slogans, posters and sporadic training programs that tend to be superficial, designed primarily for front-line personnel, lack context, focus on symptoms instead of root causes, emphasize process over outcomes, have a short half-life, and are not offered or repeated with sufficient regularity. Customer Service.Gov is based on the premise that government needs to change and get better and that, in fact, at the federal, state and local levels, entrepreneurial governments are already changing and becoming more proficient by treating people like citizens, customers and partners. There are entrepreneurial local governments all across the country that have recognized the fundamental business premise that if you take care of your customers, then the revenues and the bottom line will take care of itself. They are treating their citizens like customers and are reconnecting and rebuilding trusting relationships with their community one customer and one citizen at a time. They are putting citizens first and successfully empowering them to help themselves using many of the ten principles of customer-centered public service that are advocated in this book. Customer Service.Gov is a user’s guide for applying technology tools and the following ten principles of citizen and customer-centered public service to help governments develop and deliver better products and services: listening to customers and acting on what is learned; establishing customer-centered service quality standards and performance measures; creating an employee empowering customer-centered culture; delivering silo busting and boundary spanning services; regulating with a customer-centered perspective; selecting and hiring employees with the “right stuff” for customer-centered public service; using information technology and e-government to empower customers and employees; using e-governance and civic engagement to deliver customer-centered public service; training and empowering employees for customer-centered “moments of truth”; and using service guarantees to build trust, increase reliability and improve customer satisfaction. The chapters on how to build a customer service culture, silo busting and boundary spanning, treating people that are being regulated like customers, guaranteeing the reliability of services, using communication, information-technology and predictive analytics to deliver better government services, and integrating social media and civic engagement to enhance e-governance activities are unprecedented in their originality and uniqueness as applied to government and are not available in any other publication. 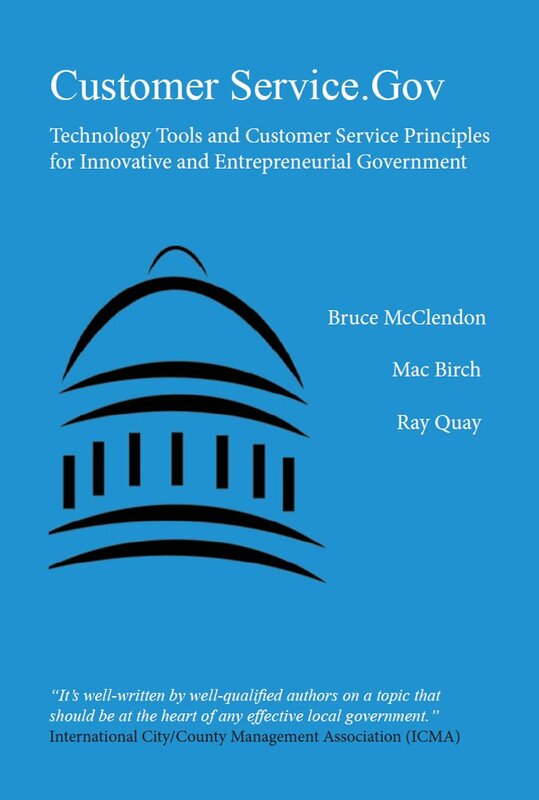 Every chapter in this book offers documented examples of the best practices and successful examples of governments that have been able to effectively improve their productivity and effectiveness and deliver better customer service. By utilizing the ten principles of customer-centered public service, local governments can transform the way they develop and deliver goods and services, reconnect with the people in their communities, and recreate the idealized relationship of governance that is, “of the people, by the people, and for the people.” It is government operating in a dimension where people are trusted, empowered and treated as customers, citizens and partners as they receive the essential services that they really need and value and are willing to pay for. In television land this would be referred to as a dimension of imagination where there is a signpost up ahead. Your next stop would be an episode of the Twilight Zone about a future and a place where the employees are from the government and they are not the punch line of a Ronald Reagan joke; they really are there to help. You can purchase the book on Kindle or paperback here.